The primary reason to book a private water fishing trip is to avoid crowds. Although most fly fishing aficionados are more than happy to share their experience with fellow fisherman, overcrowding can spoil the fun. First, too many people wading out into river waters can spook the fish, making them wary of biting your flies. Second, crowds can lead to overfishing, and in a crowded spot you’re less likely to make a successful catch. Unfortunately, the public will sometimes abuse the privilege of access to public waters and riverbanks. At times, litter can be found on what would otherwise be the pristine banks of Montana’s Smith, Madison, and Big Hole rivers. 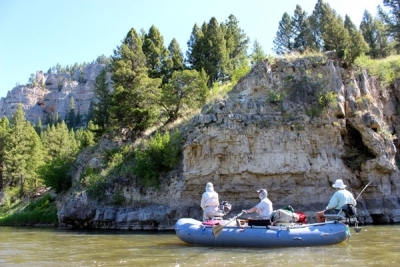 Often, private waters are much more pristine, because the landowners care about protecting their local environment, and only allow limited numbers of fly fishing trips on their property each season. Most of the guests at a fishing lodge will tell you that their dream is to catch a very large fish, no matter what species they are angling for. In private waters, you may have an increased chance of catching particularly large specimens. Also, because private waters are only fished when the owner approves a trip, the fish that pass through these waters are far less likely to become spooked than fish in high-traffic public areas of rivers. With a knowledgeable fly fishing guide, a private water fishing trip could very well end up being your best fly fishing outing yet.